Did you ever want to get out on the water? Would you like to be on the river or in the lake? Rivers have served their purpose as our liquid highways carrying goods for commercial and industrial use for many years but people are rediscovering that waterways can be pleasurable and recreational. Most cities have rivers running through them. What a better way to get people back to the river by introducing water taxis! Water taxies operate in cities over the globe. Riding in a water taxi is a unique experience. Buckle up your life vest and come aboard! 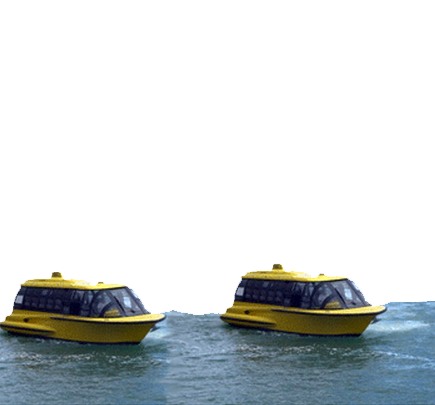 Research water taxis. Look at cities that are on the water or that have a river running through them. Watch The History of the Venetian Gondola to see the craft and culture surrounding a water taxis icon. Research water taxis that pick people up and take them up or down rivers and across the bays on a regular basis. San Francisco, Chicago, Istanbul, Paris, Venice, Amsterdam and Hong Kong are all good cities to research. Collect photographs of different taxi designs. When possible make drawings or get copies of water taxi dimensions in plan, section and elevation. Make a poster communicating water taxi facts. In this exercise you will design the route for a water taxi on a river in a city. Look at the water taxi maps of the cities you researched in activity 1. Print out at least three maps and see what the water route connects. Then select a city with a river or waterfront. Use cities that you researched or pick a new city. Using Google Earth, locate the city and print out maps at two different scales (whole city scale and building scale). When considering where you will place your taxi stations, think about connecting to other transportation systems and nodes. Look to see where the airport is (Boston has a water taxi from its airport to the city). Look at the main train terminals (Chicago has water taxi stations along the river that take train passengers up the river to work). Look at bus and subway systems. 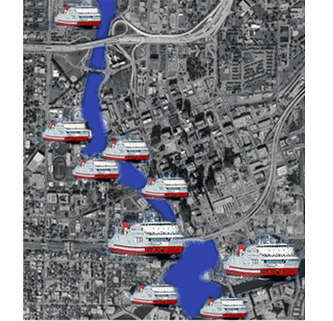 Using your large city image, plot water taxi stations along the waterfront every 15 minutes or so. Imagine a place along the river where you could propose a water taxi station. Be sure to locate on the map where the taxi station is, and where other stops will be along the way. Now you need to design the water taxi station. Water taxi stations need to have a site plan that brings people from the city to the station, through the station and onto the taxi. You will need a drop-off area, a front plaza to collect the people coming and going, a small building with a waiting room (for 15 people), a ticket area, restrooms, and a newspaper stand/snack shop. Consider a covered drop-off point so that people can walk into your water taxi station without getting wet. Think about the view to the river for the people while they are waiting for the taxi. Water taxis need to be accessible to all people, so be sure to have a ramp/or floating dock to take people down to the river’s edge to board the taxi. Water taxis must provide a life jacket for everyone who rides. Water taxis are a fun way to get around! Rivers are no longer used for transportation. River taxis are an ancient form of transportation before trains and cars. Many cities have river tours with guides that point out the history of the city from the water.